I was browsing through my Google reader looking for ideas for breakfast and I remembered that my virtual blogger friend Toni had this awesome milinki recipe that I swore I'll try when I have more time. For my English speaking audience the word Milinki doesn't speak much, but this is indeed a "bread"-like breakfast that every Bulgarian child knows and has a lot of memories with. 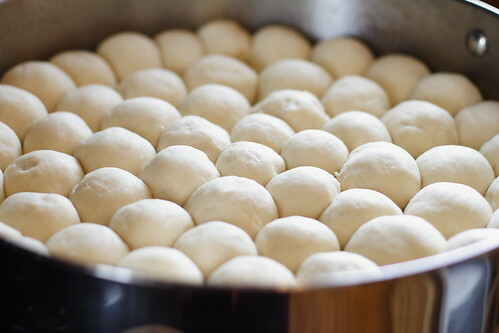 Every Bulgarian kid has a story about their Grandmother's Milinki, filling the whole kitchen with the aroma of freshly made dough. 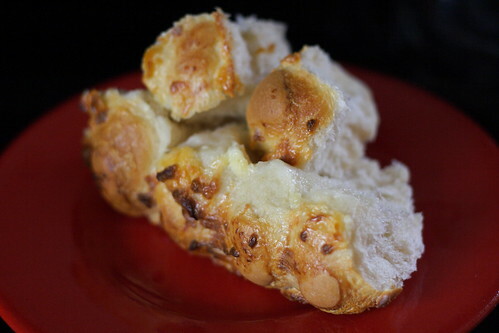 The sneaking up under the table so you can look under the cover of the pan where Grandma left the dough balls to rise, the hot fumes coming out of the freshly baked bread, the crunchy outside and flaky melting inside....aaaaahhhhhh...those were the days! And then again at school, sharing the milinki with a friend. I was even hiding money form my allowance from my parents so I can buy it, because my parents didn't allow me to eat at school because it was in their opinion less healthier than homemade food. :-)So many memories! So, I found Toni's recipe and I tried it and it was even better than I expected! I'll translate the recipe for my English readers and will attach my pictures of making the milinki. Have in mind that I have made couple of changes of the original recipe and added some notes too. * In the original recipe there is sugar, I omitted that in mine. * Note: I have used a breadmaker but if you don't have that, you can make this kind of dough the regular way. Just remember that it has to rise twice, ones as a whole dough ball, then in the baking pan already shaped. 1. Sift the dry ingredients together ( flour, salt, yeast) and set aside. 2. Stir the liquid ingredients( milk and vegetable oil) to the breadmaker's pan and then add the dry ingredients. 4. Mix the ingredients together for the topping- milk, feta cheese and vegetable oil. Preheat the oven to 375 F.
5. When the dough has risen ones, grease a 14 inch ( diameter) round pan ( or you can use 14/9 rectangular baking pan). 7. Let the dough rise a second time in the pan, already shaped. When the dough has doubled it's size, sprinkle the topping on top, trying to spread it evenly. 8. Bake for 45 min on 365 F or until ready. 9. When it's ready, leave it to cool down for 2-3 min, then take it out of the pan. Serve warm, with milk, yogurt drink, cheese or with tea. P.S: Thank you, Toni for the wonderful recipe!!! И какъв хубав увод си направила! Тони, радвам се, че ти харесва! :-) Твоята рецепта е чудесна! Ани,не те познавам,но от сайта/гответе с мен/попаднах и на твоя блог-трябваше ми доста време да разгледам красотите които твориш.Прекланям се пред таланта ти!Бих искала да ми дадеш рецептата за сладкиша със сините сливи-много вкусен изглежда.Можеш да ми пишеш на имейла-zoii@abv.bg-казвам се Живка и ми беше приятно да се разходя из снимките ти.